We are creeping ever-closer to magic number 100, as you are probably aware. But, hey, why fixate on the future? There's every possibility the world could be thrown into cataclysmic upheaval, giving rise to a world of intelligent rifle-wielding apes that, as here, look cooler than all hell. So let's just pay attention to where we're at, and what's happening now, and also...show notes! 0:53-3:53: Some tough work engagements for Graeme this week! Let him tell you about it. 3:53-11:23: For example, Graeme talks the Siegel-Schuster lawsuit and the recent article written about the Schuster side of the lawsuit. For those of you who like Mr. McMillions when he's having ambivalent feelings, these seven and a half minutes are for you. 19:48-22:41: And then one of those wacky tech problems pop up and necessitate a call back. Minor slight delay and then minor chitchat about the Internets. 22:41-38:18: Back to Rob Liefeld vs DC: Graeme talks about why this story will blow things open wide for DC, while Jeff is not so sure. It moves into a conversation about emotional attachments to creators, companies, and concepts. 38:18-42:28: Challenged about what comics can be read in five minutes, Jeff talks briefly about the twelfth issues of Flash, Batwoman, and Wonder Woman, and compares them a bit with Batman, Inc. #3. 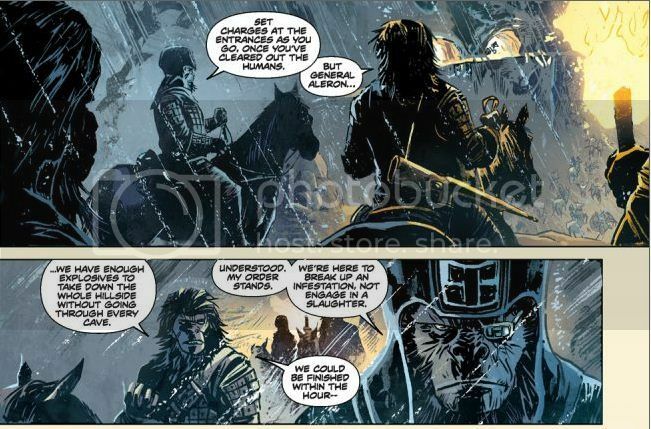 42:28-49:08: Also, Jeff has lots of good things to say about the Betrayal of the Planet of the Apes trade paperback with gorgeous art by Gabriel Hardman (see above) and a strong script by Hardman and Corinna Bechko. As an Apehead who's late to this book, I have to say it's pretty darn great. 49:08-56:26: And as we are on a recommending roll, Graeme recommends the first issue of Mark Waid and Chris Samnee's Rocekteer: Cargo of Doom. 56:26-1:05:04: And then, just to keep the balance, Graeme reviews Before Watchmen: Dr. Manhattan #1. He... is not pleased. The phrase "eye-bleedingly bad" may end up being used. A bit of stuff about BW: Rorschach is included for your enjoyment. 1:14:08-1:37:21: Invited to talk about stuff he's read and liked this week, Jeff declines and instead chooses to complain about...movies. More specifically, Captain America The First Avenger which is on Netflix Watch Instantly. Also discussed: The Bourne Legacy and Battleship. 1:37:21-1:42:30: Of course, that trifecta of movie cannot help but inevitably lead to Graeme talking about...Bunheads. Well, sure. Of course. 1:42:30-1:54:22: And then, because somehow we end up out of time, we mention more comics we also find noteworthy SAGA #6, Fatale #7, Batman Inc. #3, Mind MGMT #4, and Glamourpuss #26. Also some speedy head-scratching from Jeff about the Butcher Baker blow-up. What does it mean to be a critical darling? Is there a "tastemaker" for comics on the Internet? 1:54:22-end: And here is where we open up the question to you, our listeners: have you ever bought a book based on something we said? If so, what and how'd it go? Who are the people in the comics blogosphere you consider tastemakers? We want to know! So you know...sound off in the comments, please. And, as always, thank you for listening!